I discovered a new 10mm WSS miniatures maker, look at the quality! The first packs of WSS infantry and the first command pack is ready, they are available for those of you who want to see our miniatures and to have a feel of what this range will be about. 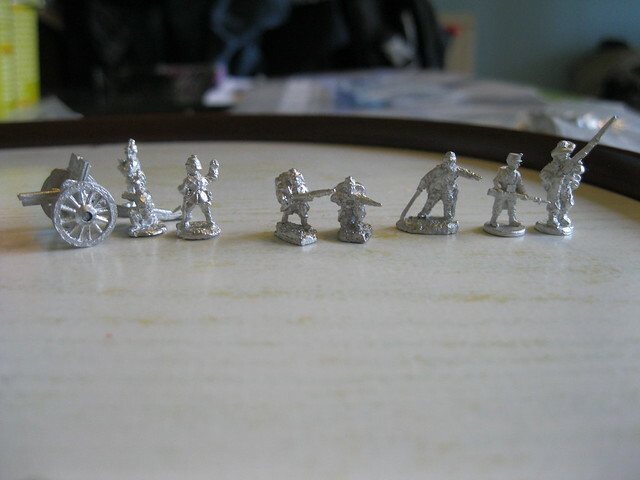 The infantry pack contains 4x7 miniatures in march attack and two different sergeants(30 figures). The command pack contains 10 different command figures. I will follow with interest the development of this company, the quality of the casts is superb! Indeed they are beautifully cast figures. I have a number of his WWI Belgians. Unfortunately his development of ranges is incredibly slow. Only one more code of Belgians have appeared in the last two years, and the Belgian armoured train has been promised for as long as I have had contact with that company. If you really want to get into using this company for 10mm WSS you may have a very long project on your hands. Question is - as a manufacturer with 2 sets only - do they look well together with other figures? For the moment I have no such project in my mind, but I am a 10mm scale fan, I had painted thousands of 10mm North and South ACW figures and we had really enjoyed very large scale battles! What drew my attention was his superb sculpting technique, his minis have a very good anatomy and detail. I have realized that he is a very small company and very slow to produce new codes. So, I will be just following and if he produces just one code of cavalry and artillery, I feel I'll start buying. I find his 1/144th figures are compatible with both Pendraken and Irregular Miniatures 10mm, but not with Kallistra 12mm, which are taller and stockier. 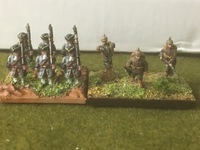 L to R Pendraken German artillery, Irregular Belgians advancing, kneeling and officer, Van Dyck Belgian infantry, Kallistra Confederate infantry. Thank you for taking time to show us the comparison! The photo does emphasise the crispness of the Van Dyck figures compared to other companies, although they all seem to paint up well. When it comes to the WSS Pendraken has a very comprehensive range that are well sculpted. They also have a beautifully sculpted League of Augsburg range, and as a result of client pressure the LOA commanders have also been issued as a separate pack in tricornes to go with the WSS range. Unfortunately the Irregular range is not up to the same standard, but does have some very useful items such as limbers with horses in single file. Leman is absolutely right, he put me onto the company and I got a few WW1 Germans which one day may take on his Belgians. The Van Dych models are very nice, and the company is good to do business with (quick delivery and replies to Q) but they are very slow to add figures to a range. They certainly fit with Pendraken. To add to Lemans pics here are some Van Dych Germans stood next to Pendraken WSS French and then Pendraken LoA. They are crispy sculpts for sure, a good choice for anybody wanting a 10mm Marlburian army. 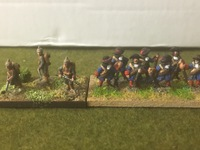 I saw the van Dyke French infantry when they were first offered and I couldn't believe they were only 10mm. I liked them so much I ordered two packs of the infantry even 'though I have no intention of doing WSS in 10mm. When I got the figures and got a good look at them, I was just as impressed. They are just as perfect up close and in reality as the pictures I saw. However, they sit. For one thing, I do not like the marching pose for a wargames table. I'd rather have advancing. 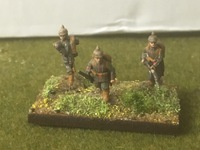 For another I'm putting my time and effort into SYW 15mm. I have been back to admire them a time or two, however. If van Dyke ever starts producing an "advancing" figure for the period I may well be sucked in. They are beautiful. Until we wait for van Dyke, I would like to make my best compliments for the beauty of the figures in your collection! They are marvelous and it would be great to have more pictures of them! Cheers! I have to admit to being a fan of the marching pose, as this is how the line regiments of the armies tended to approach each other. for much of a battle they would have been marching. It is also a good pose for figures that are going to be played with as there is less likelihood of bending and snapping of weapons. they are also much more straightforward to paint. I think that most of the time the troops were marching or standing around. I prefer a mix of charging, marching, firing and reloading poses. Some units like Wild Geese are so famous for their charges that charging poses for them are just looking great. Units in a standing at ease pose are just looking boring for most of the game. I think that a unit with all men lower their muskets to shoot was a rare sight on every battlefield. Is an advancing pose the same like a charging pose? I would imagine the advancing pose has the figure walking whereas the charge shows the figure running. In my ACW armies my favourite pose is right/left shoulder shift, which is how most of a charge was carried out at that time, the musket only being lowered in the last few yards (I assume to avoid accidental friendly bayonet wounds. In the SYW actions seemed to be somewhat more sedate (to maintain the line) and the charge went in (if at all) only after a firefight.